Last week we invited you to join us on Instagram for a firm tour of Gresham Smith to get a feel for what it’s like to work in a firm in Jacksonville. This week on I Want to Work In (#iwtwi), we are featuring the top five places to eat, sleep, work, and play in Jacksonville, FL. This list will help you familiarize yourself with the city being featured in case you are interested in living and working there in the future! Amelia Island – The northernmost barrier island on Florida’s Atlantic coast, this community is located about 30 miles north of the city. This vibrant seaside town is not only known for its pristine beaches, but also for its many golf courses. The island also boats a 50-block National Historic District with a variety of shops, restaurants, and bars. San Marco – San Marco is a historic neighborhood just a few minutes from downtown Jacksonville. The community is filled with distinctive boutiques and art galleries, as well as a full-fledged dining district that has plenty of outdoor café seating year round. Ponte Vedra Beach – This seaside community is located about twenty miles southeast of downtown Jacksonville. The area is best known for golf and is home to the PGA Tour and The Players Championship, which is played at TPC Sawgrass. Ponte Vedra Beach is often described as an “Old Florida resort town with New Florida amenities,” having embraced its nostalgic setting while also providing the perks of city living. Riverside & Avondale – Riverside and Avondale are two adjacent and closely associated neighborhoods, often considered one continuous neighborhood, in Jacksonville. The area is primarily residential, but also includes some commercial districts such as Five Points, the King Street District, and the Shoppes of Avondale. Nocatee – Located about 20 miles east of downtown Jacksonville, Nocatee is one of the fastest growing master-planned communities in America. The community boasts the best schools in the area and blends a variety of neighborhoods, parks, recreation, offices, shopping, and restaurants. Hawkers Five Points – Hawkers redefines “eating Asian” in the states, featuring the best and most popular street foods from all over Asia on one menu. Nestled in Jacksonville’s Riverside-Avondale district, the restaurant offers eclectic dining, entertainment, and retail in a historic core of the city. Cowford Chophouse – This upscale dining experience features a restaurant and rooftop bar serving steaks, seafood, and cocktails. Located in a historic landmark at 101 E. Bay Street, the restored building honors Jacksonville’s history. River & Post – Located at the corner of Riverside Avenue and Post Street, this restaurant concept offers a rooftop lounge overlooking downtown Jacksonville and the St. Johns River. The Bread & Board – Bread & Board is equal parts sandwich shop and fine dining kitchen. The space always smells of freshly baked bread and offers a genuine sense of community. Fogo De Chao – This full-service, authentic Brazilian steakhouse was originally founded by brothers from Rio Grande do Sul and now boasts locations in several major Brazilian and U.S. cities. Jacksonville Beach – Beach volleyball, surfing, fishing and a wide variety of eateries – Jacksonville Beach has it all. Surfers are drawn to the area for some of the best waves in the region. You might even see a dolphin or two! Camping & Hiking – Residents can enjoy outdoor activities like camping, hiking, and cycling in state recreation areas like Hanna Park and the Timucuan Ecological and Historic Preserve. Topgolf – Visit Topgolf to hit a few golf balls surrounded by friends, food, and drinks. iFLY Indoor Skydiving – Experience indoor skydiving in a flight chamber at iFly. Volstead – Volstead is one of the area’s best-loved bars based on its uniquely crafted cocktails and cozy atmosphere. They offer cocktail workshops, which is a fun way to learn how to make a mean drink while socializing with friends. Jacksonville Downtown Library – The Main Library is the cultural hub of downtown Jacksonville. With several permanent art exhibits, three rotating gallery spaces, a Makerspace, and a gorgeous grand reading room, there is so much to see. The best part? It’s all free! You don’t need a library card to enjoy the art, wealth of programs or quiet study space within these walls. 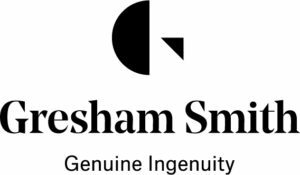 Gresham Smith Office / Breakroom –Gresham Smith has invited all ARE test takers to use their conference room or break room after hours to study and prepare for the architectural licensure exams. Our downtown Jacksonville office occupies the entire 22nd floor at 225 Water Street and offers a 360-degree view of the St. Johns River and city. Hemming Park – I used to occasionally study at this family-friendly park in downtown Jacksonville! Dunkin’ Donuts / Starbucks – Although I’m a Dunkin’ girl, pick either one of these chains and order a cup of joe to study for the ARE. My back yard – I found serenity to study and prepare for the exams in my own backyard overlooking a pond. Never underestimate the spaces right in front of you! Jacksonville Veterans Memorial Arena – This arena is home to Jacksonville’s NFL team, the Jaguars, as well as the Jumbo Shrimp minor league baseball team and the Armada FC professional soccer team. Other teams that frequent the arena include the Sharks indoor football team and college and minor league basketball teams. Rain Dogs – Stop in and enjoy a pint of chilled lager or watch a local band at Rain Dogs, a Jacksonville favorite for great drinks and live music. The bar’s walls are adorned with some quirky works of art and the music program is a refreshing break from the typical 90s grunge. Keg & Coin – Known to be the best arcade bar in Jacksonville, enjoy some beer and relive the best of the 80’s & 90’s arcade games at Keg & Coin. AIA Jacksonville – The Jacksonville chapter of the American Institute of Architects always has events going on and is a great place to meet fellow young professionals. The organization’s Emerging Design Professionals subcommittee and Women in Architecture committee also have frequent events. Porch Fest – One of my favorite Jacksonville activities, Porch Fest is a community music festival in the city’s revitalized Springfield district. The giant block party is great for getting to know people!